You can walk to Ciovo island without getting your feet wet! Just cross the tiny arched bridge that links the island with During the season there is a water taxi that goes right from Split‘s waterfront Riva to Slatine on Ciovo’s eastern shore, as well as to a dock a short walk from the bridge that links the island to Trogir‘s old town. There’s frequent bus service from Split too via the #37 bus. The island is filled chock a block with apartments and hotels offering very inexpensive family escapes. Near Okrug Gornji village, the most popular tourist destination is Saldun Bay with sandy beaches on either side of its marina. Mavarscica, a bit further south, is another fine pebble beach with a beautiful cove surrounded by pine woods. If you want a real sandy beach, hire a boat and head for the small islands nearby. 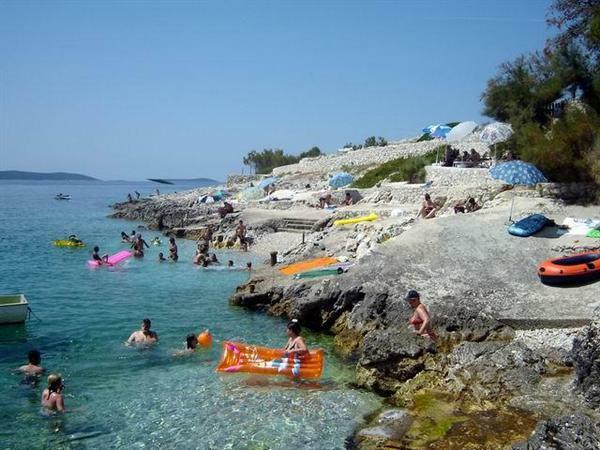 The most beautiful beach is located in the cove of Vela Rina, but Drvenik Veli has two lovely coves, and if you like to sail, gunkholing at Solinska and Krknjasi are perfect. Around the island there are some interesting medieval churches and monasteries, but the main lure is swimming and diving. To get away from the crowds, the southern part of Ciovo island is the place to go. –Ciovo doesn’t have its own tourist office, but these folks will help! complete service….beautiful website with music and great photos! –in the remains of the Church of All Saints, on Bl. Augustus Kazotica 5, which the owners lovingly restored, creating a wonderful art gallery and travel agency. Well worth visiting and nice people too! –expert, personal service, on Trogir’s waterfront Riva as you cross the bridge from Ciovo.